During His stay at Kamalapuram, poetry flowed from Sathya’s pen to such an extent that a local shopkeeper enquired if the boy would consider writing out an advertisement for his store. Eventually Sathya agreed. The result was a huge success. In payment, the retailer wished to offer the lad some new clothing which the child poet refused to accept. Noticing the shop owner’s reluctance to take the clothes back, Sathya declared He would distribute them among the beggars — a vivid demonstration of His containment on desires and not seeking the fruits of one’s action. Subsequently, more shopkeepers came forth requesting the sweet poetry of Bhagavan. In time, Seshama Raju got tired of these activities, and since school was out of session, he sent his younger brother back to Puttaparthi. 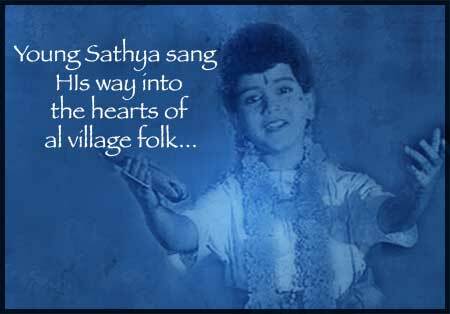 Sathya’s pen, however, continued to churn out lilting out poems and songs - this time to provide social commentaries. With a group of boys, His verse gently mocked the latest fashions, from face powder to wrist watches. With leather belt tied to it. What fashion is this, Oh Dear! Baba has said that He engaged in such activity to reform the elders in the village. He would observe their weaknesses, compose appropriate songs deriding their behaviour and make the young boys sing those satirical compositions in front of their houses. Bhagavan has explained it was an attempt to bring about transformation among those who had strayed. There were more poems undertaken for various reasons and the demand for them continued to grow by leaps and bounds. Meanwhile, Seshama Raju returned for vacation. A poet himself, the elder brother became jealous of Sathya’s popularity and whisked Him away to Uravakonda where Seshama Raju had been hired as the school’s Telugu teacher. 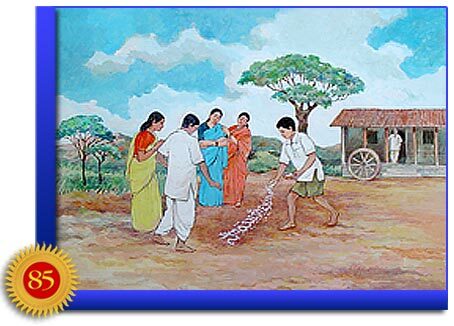 Sathya became the leader of the Uravakonda School Prayer Group. When the playwright, William Shakespeare, wrote “all the world’s a stage, and all the men and women merely players,” he wittingly or unwittingly gave a description of the Divine drama. This opened the eyes of the elders, who decided to mend their ways in regard to speaking the Truth and living up to it. “Cheppinattu Chesthara?” clearly showed Baba’s early concern that education includes moral instruction. The seeds of Educare had been planted. And, the play foreshadowed an important event still to come. 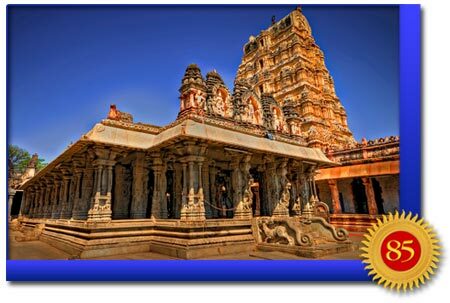 When things went missing in Uravakonda, the people would turn to Sathya for help. The child also gained the respect of the Muslim community when the owner of a horse drawn cart lost his horse. Frantic searches had yielded nothing and the man stood the chance of losing his sole livelihood. Friends directed the hapless gentleman to a certain wonder-working student. Sathyanarayana Raju described a grove a mile and a half from town, and sure enough, the stallion was quietly grazing by itself. Following this incident, the Muslim owners of other horse-drawn carts insisted on giving Sathya a lift to school, in the hope of retaining the luck the boy instilled. In this way, unity in diversity was demonstrated. The date March 8, 1940 marks a cosmic turning-point. Sathya was allegedly stung by a scorpion. His health became impaired and his behaviour appeared to undergo a change. The village medics were consulted to little avail. Some were convinced that Sathya had fallen under the spell of evil spirits. All sorts of quack remedies were tried but to little effect. A frantic message was then sent to Sathya’s parents in Puttaparthi and both rushed to Uravakonda, consumed with anxiety. Everyone was puzzled as Sathya was no longer the one they knew. He appeared remote, withdrawn and indifferent to worldly matters. If He spoke, which was rarely, it was always about spiritual topics. 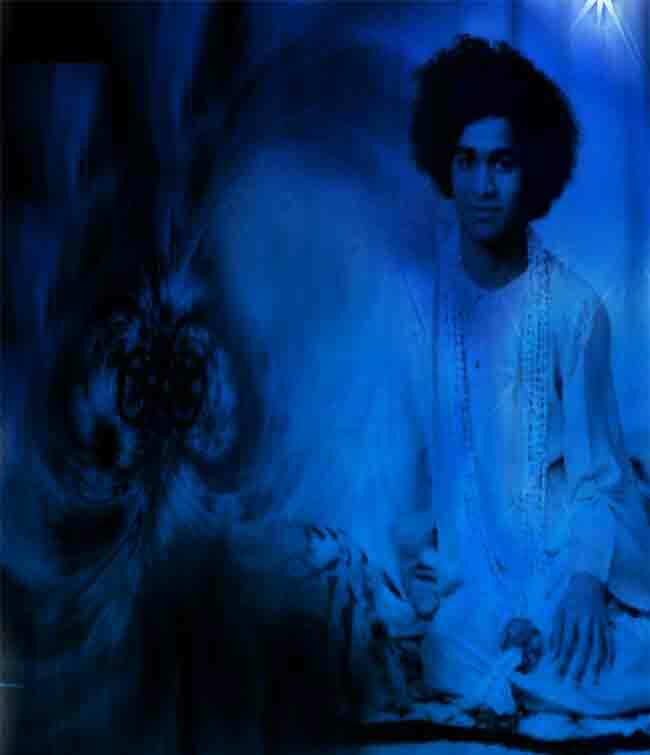 At times, He would burst into Vedic hymns He had never learnt. On matters philosophical and metaphysical, He dared even to correct elders, acknowledged experts and scholars. Sathya was taken to locations such as Bellary and Dharmavaram for treatment but there was no improvement. Eventually, He was taken to an exorcist in Kadiri who was mean and cruel. Here, young Sathya was put through painful rounds of physical torture. Of this treatment, Baba, speaking in the third person, told devotee Jack Hislop, “During all the torture, He smiled and felt no pain. He, at no time, had even the slightest body identification.” Finally, the demonic witch-doctor’s treatment became too much for the family and Sathya was whisked away back to His home in Puttaparthi. Thus, the glory of the Lord was not to be stayed and suggested itself in curious events and confrontations, now cherished and pondered over by devotees. 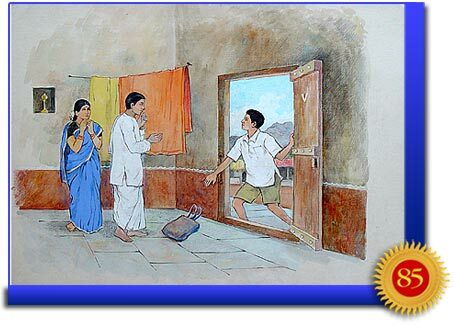 On May 23, 1940, Sathya rose from bed in a good mood and called the members of the household round Him. He materialized sugar candy and flowers. Neighbours soon rushed in, receiving these goodies and rice balls cooked in milk, all appearing from nowhere at the wave of the Divine hand. Sai Baba of Shirdi was not widely known in those parts then, but word soon got around about a certain ‘Muslim miracle worker’ by the same name. We can only imagine the confusion of the Raju family. Just as Mother Easwaramma had her share of trials with her spirited child, Father Venkapa Raju was stymied in his desire to protect the boy from Himself. As for the older brother, Seshama Raju still held fast to his plan of pushing Sathyanarayana through high school to make him eligible for “public service” and secure a dependable government job. Unmoved by Sathya’s words, he took Him to Uravakonda and enrolled Him once again in the school. The Thursday worship continued there and the many pilgrims who assembled weekly included the Headmaster and Assistant Masters of the school. The Chairman of the Municipal Council of Bellary and his wife, acting on a dream that each of them had had simultaneously, searched for and found the boy “Sathyam” at the house in Uravakonda. Bowing before Him for all to see, they sought and procured a sight-seeing vacation for the Divine Boy and His older brother. Seshama Raju was happy for the diversion, thinking it would do his brother some good. Several historic sites were surveyed in Hampi. When the group was about to enter the Virupaksha Temple, Sathya made an excuse of an aching stomach, and accepted the task of watching the luggage outside the temple. They went inside the temple. At that time, arathi (the ritual of burning camphor in front of the deity) to Lord Virupaksha was going on. Surprisingly, they could not find Lord Virupaksha’s idol there. Instead, they saw Me there! Seshama Raju was furious. He thought ‘Sathyam told me that he would not come into the Temple and stand outside. Thereafter, He must have stealthily sneaked into the sanctum-sanctorum and stood behind the idol. What a great sacrilege!’ However, the Municipal Chairman Ramaraju did not think so. He said to himself, ‘Virupaksha is Raju and Raju is Virupaksha.’ Seshama Raju came out immediately and searched for Me. Sathya was given a gold pin to wear as a parting gift from the Municipal Chairman. It was reluctantly accepted by the boy. But, upon His return to Uravakonda, this present fell from His shirt collar and vanished. With the loss of the collar pin, Baba demonstrated that maya or any illusory attachment could not bind Him any longer. He was poised to make a declaration that would – in time – resonate throughout the world.